The Early Church Fathers, their lives, and their sacrifices for Our Lord and His One Holy and Apostolic Church. © Faith of the Fathers, 2005-2018. All rights reserved. Saint Fulgentius of Ruspe (also known as Fabius Claudius Gordianus Fulgentius), a Latin Father of the Church, was born around 465 A.D. at Telepte, Carthage. He was born to a Roman senatorial family, and was well educated. His father Claudius, died while Fulgentius was still quite young. His mother, Mariana taught him to speak Greek and Latin. He became so good at Greek, that he spoke it like a native, and committed all of Homer to memory. He was also well trained in Latin literature. As he grew older, he managed his house wisely in subjection to his mother, and Fulgentius quickly gained wide respect for his conduct of the family affairs. This reputation helped him to acquire a post as a civil servant in the government of Rome, as a procurator of Byzacena. He quickly grew tired of the provincial life. This, together with his studies of religion, particularly a sermon of Saint Augustine of Hippo on Psalm 36, led to his being attracted to a religious life, and he soon entered a monastery, became a monk, then was ordained, and became abbot. At the time, the Arian persecutions had ceased, but the election of Catholic bishops was forbidden. In 508 it became necessary to defy the law, and bishops were consecrated, Fulgentius being chosen for Ruspe (modern Kudiat Rosfa, Tunisia). He was exiled with 60 other bishops to Sardinia. There they built a monastery, and continued to write, pray, and study. Fulgentius was invited back to Carthage by the Arian king Thrasimund to hold a debate with his Arian replacement around 515, and so successfully refuted his Arian opponents that he was exiled again in 518. King Hilderic succeeded Thrasimund in 523, and permitted the exiles to return. Peace finally being restored to the African church, Fulgentius returned to his diocese. Saint Fulgentius preferred to return to his monastery and resume his studies, but he was such a popular preacher, he was kept busy in the pulpit until his death. Some letters and eight sermons survive by Fulgentius. Fulgentius's work shows knowledge of Greek and a strong agreement with Saint Augustine of Hippo. 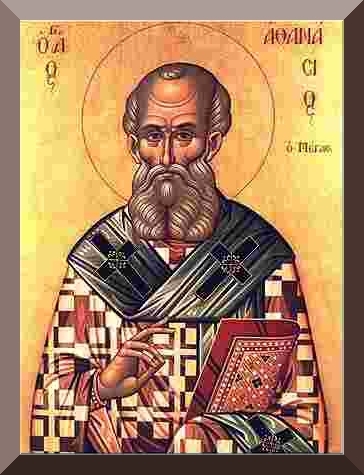 He wrote frequently against Arianism and Pelagianism. 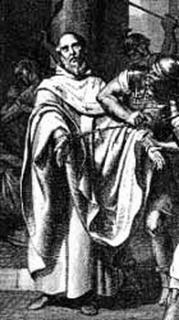 Saint Fulgentius of Ruspe died of natural causes around 533 at Ruspe. Some of his relics are located at Bourges, France. Below are a few quotations from Saint Fulgentius of Ruspe. Let everyone, therefore, who does not wish to be condemned to the endless punishment of the second death now hasten to share in the first resurrection. For if any during this life are changed out of fear of God and pass from an evil life to a good one, they pass from death to life and later they shall be transformed from a shameful state to a glorious one. From a treatise on forgiveness. We do not, however, only say “your Son” when we conclude our prayer. We also say, “who lives and reigns with you in the unity of the Holy Spirit”. In this way we commemorate the natural unity of the Father, Son and Holy Spirit. It is clear, then, that the Christ who exercises a priestly role on our behalf is the same Christ who enjoys a natural unity and equality with the Father and the Holy Spirit. From a letter. 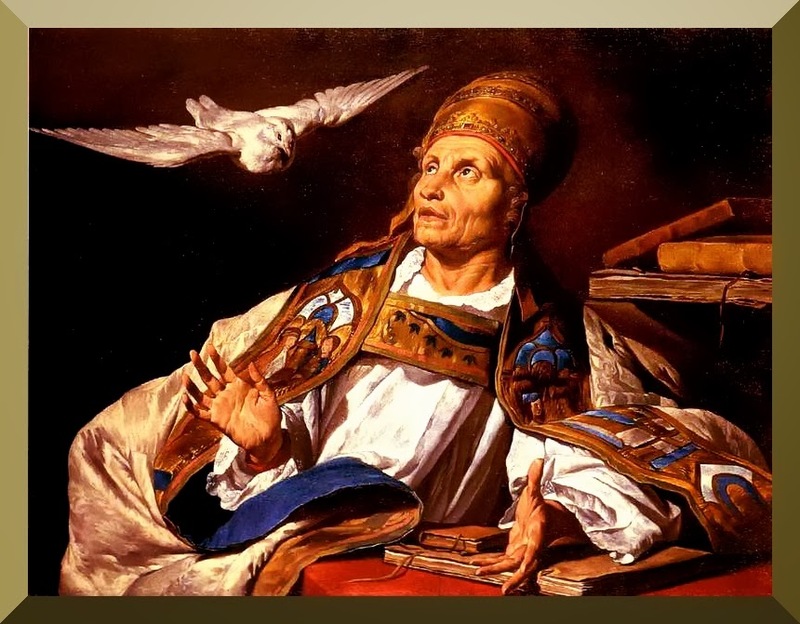 Pope Saint Gregory the Great (also known as Gregory I; Gregory Dialogos; Father of the Fathers) was born in 540 A.D., at Rome, Italy. Saint Gregory is a Latin Father of the Church, and Doctor of the Church. He is also one of the four Traditional Doctors of the Latin Church (along with Saint Ambrose of Milan, Saint Augustine of Hippo, and Saint Jerome). Gregory was the son of a wealthy Roman senator and Saint Silvia of Rome. He also was the nephew of Saint Emiliana of Rome and Saint Tarsilla, and the great-grandson of Pope Saint Felix III. Gregory was educated by the finest teachers in Rome. He was prefect of the city of Rome for one year, then he sold his possessions, turned his home into a Benedictine monastery, and used his money to build six monasteries in Sicily and one in Rome, and he entered the Benedictine Order, where he was a monk. He was appointed cardinal-deacon, and then sent to the Byzantine court to secure aid against the Lombards. The result of his six year sojourn was a conviction that Rome must not rely on the East for help. After his return he saw English children being sold in the Roman Forum, and he wanted to become a missionary to England. The people of Rome would not allow him to leave. His desire was realized when he sent Saint Augustine of Canterbury, with a band of missionaries to England in 590. Gregory was elected 64th Pope by unanimous acclamation on September 3, 590, and was the first monk to be chosen as pope. With his election to the papacy, he published a work on episcopal duties, which was used for centuries. He enforced the celibacy of the clergy, and supervised church funds. Although he strengthened the prerogatives of the papacy by demanding supreme authority over all churches, judging bishops, and hearing the complaints of prelates, he was always tactful in dealing with secular authority. He established the system of appeals to Rome, and is recognized as an administrator and lawyer. Gregory collected the melodies and plain chant so associated with him that they are now known as Gregorian Chant. He also sent missionaries to France, Spain, and Africa. Gregory wrote some very influential works on the Mass and Office. Pope Saint Gregory the Great died of natural causes on March 12, 604 at Rome, Italy. It is only right, with all the powers of our heart and mind, to praise You Father and Your Only-Begotten Son, Our Lord Jesus Christ. Dear Father, by Your wondrous condescension of Loving-Kindness toward us, Your servants, You gave up Your Son. Dear Jesus You paid the debt of Adam for us to the Eternal Father by Your Blood poured forth in Loving-Kindness. You cleared away the darkness of sin by Your magnificent and radiant Resurrection. You broke the bonds of death and rose from the grave as a Conqueror. You reconciled Heaven and earth. Our life had no hope of Eternal Happiness before You redeemed us. Your Resurrection has washed away our sins, restored our innocence and brought us joy. How inestimable is the tenderness of Your Love! Leave A Tip To Show Your Appreciation For This Blog. Tips May Be Made Securely With PayPal. Thank You, and God Bless You! N. C. Right to Life Inc. Requesting Prayer to Our Lady for Our Country! Liberal Abortionists Advancing! See What the Biased Media isn't Reporting! Pope Francis Derangement Syndrome Vol. XXI: Lavender Mafia Edition. Passionist Nuns Have a New Blog! Vocation - finding real joy and meaning. CatholicChatter.com | Catholic topics, events, and chatter from around the Catholic blogosphere. Mystic Monk Coffee. Real Coffee, Roasted And Blended By Real Monks. Order Yours Online.